Hotel Olimpia, Florence. 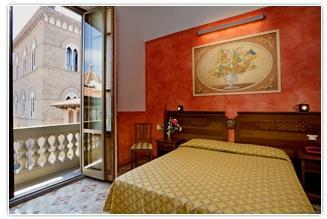 Olimpia Hotel Florence. In the heart of Florence and immersed in the quotidian life of the city, among its famous cafés, always frequented by literary and artist, in Piazza della Repubblica lies the Hotel Olimpia our 3-star hotel. All the main monuments are located close to the hotel: the celebrated Duomo built by Brunelleschi, the splendid and romantic Ponte Vecchio, Galleries of the Academy and Uffizi, famous all over the world for their splendid collection of universal masterpieces. From the windows of the hotel you can admire all of this. We are ready to welcome you in accurate and warm ambiences: it will be like to be in your own home. Enjoy the typical style of the end of the 19th century: enter and enjoy our spacious and luminous rooms provided with every possible comfort. Our kind and professional staff is always at your disposal, in order to offer useful information about your permanence. In the heart of the historic and monumental Florence with exclusive views over the famous monuments of the city, a unique structure that will offer you the real Florentine life in one of the most beautiful and picturesque squares of the city.